Sir Peter Thomas Blake, CBE, RDI, (born 25 June 1932, in Dartford, Kent) is an English pop artist, best known for his design of the sleeve for the Beatles’ album Sgt. Pepper’s Lonely Hearts Club Band. He has also designed an exclusive collage for Chelsea Football Club for the 2010 season. He lives in Chiswick, London, UK. During the late 1950s, Blake became one of the best known British pop artists. His paintings from this time included imagery from advertisements, music hall entertainment, and wrestlers, often including collaged elements. Blake was included in group exhibitions at the Institute of Contemporary Arts and had his first solo exhibition in 1960. It was with the ‘Young Contemporaries’ exhibition of 1961 where he was exhibited alongside David Hockney and R.B. Kitaj that he was first identified with the emerging British Pop Art movement. 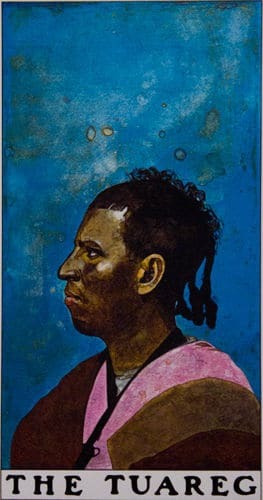 Blake won the (1961) John Moores junior award for his work Self Portrait with Badges.